Tree Kale or Perennial Collards? For years I have been overly suspicious of the Brassica family. Growing up, I remember seeing cabbage butterflies annihilate cabbage plants and not caring much for the taste of coleslaw or sauerkraut. Later, the only thing I correlate cabbage with is boiled cabbage, which gives me indigestion. 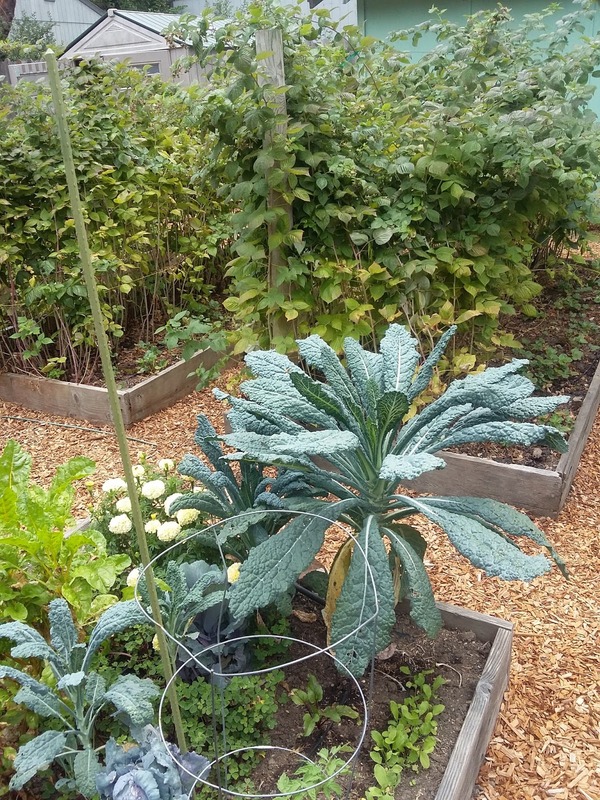 The few experiences I had with growing Brassicas included growing broccoli and Brussel Sprouts, which were a lot of hard work for a meager crop. Then a few years back I heard tales of a super-rich nutrient-packed vegetable called Kale. A good friend of ours even introduced us to Kale chips – an incredibly tasty and healthy snack whose flavor was reminiscent of a fine cheese. Recently, with moving to California and having easy access to cheap kale, I thought I would give it a try - and I started liking it. While consuming kale in soups last winter, I read a book that mentioned perennial kale – and I was hooked. 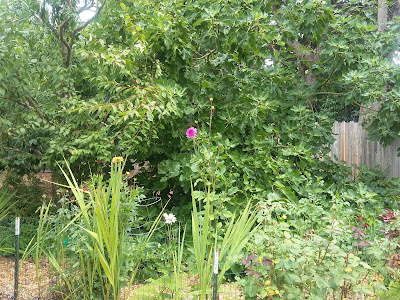 The idea of having a plant I did not have to re-plant year after year really appealed to me. You mean that I can access a healthy vegetable any time I want – with minimal effort? You bet! March 25th after a light rain. Being the resourceful individual that I am, I presented my desire to identify a local source for some perennial kale to individuals at my local county garden extension class and happened to find that a master who possessed some tree collards that he was happy to share with me. It turns out that they are that tree kale and perennial collards are the same thing. It looks like I got the greenhouse in May as well. So far so good. I read that tree kale/perennial collards require a lot of calcium, so I made sure to add a lot of crushed egg shells in the hole where I deposited each plant. They have done incredibly well. The only other thing I would have done, if I had a chance, would be to stake them. That being said, the location that I planted them, they were able to lean up against the fence, then against the greenhouse. Perennial Kale in June - lower leaves do die out a bit as the plant matures. Some of the caterpillars were less fuzzy, with a white stripe. 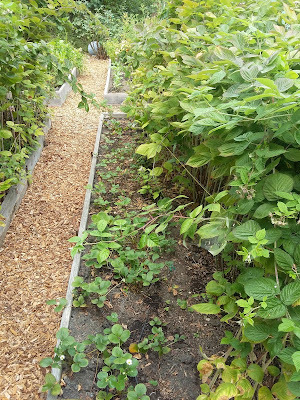 I believe if I continue to plant them further down the fence line, like I plan to do next spring, I will need to stake them. 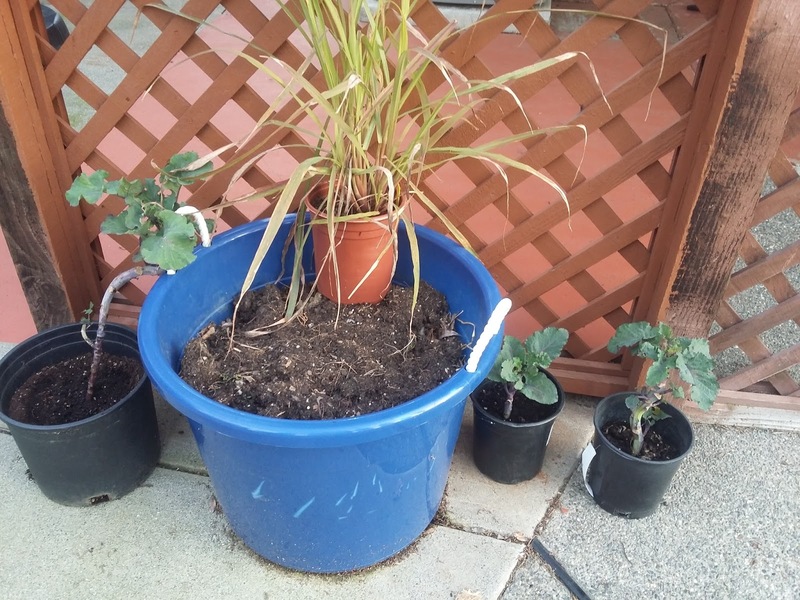 Other than the plants getting a little too large mid-summer, they have been relatively simple and easy to care for. Also – I still don’t care much for the cabbage butterflies that the plants attract to the yard. 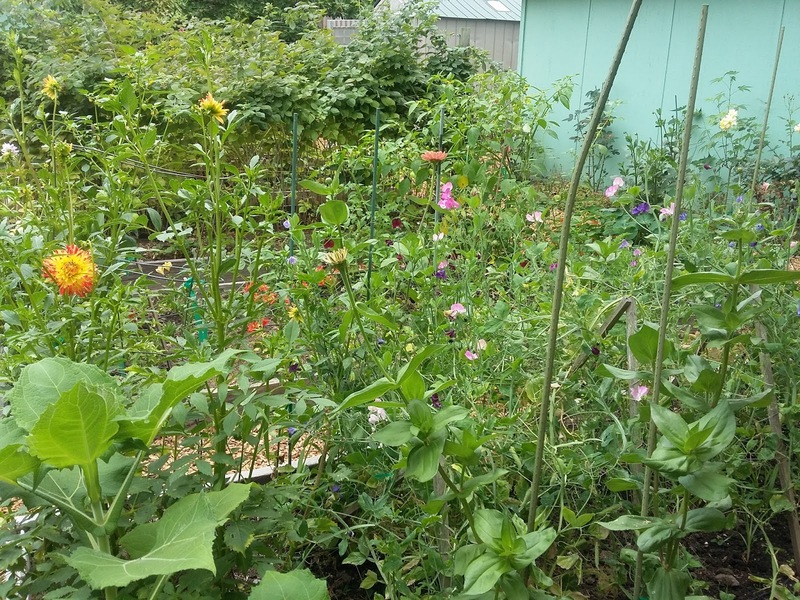 In the spring, it took some concerted effort to fight against the caterpillars, but by the summer it paid off – when spiders, small wasps and other critters began helping me by preying on the caterpillars. Tree Chard, August - at just above 5' tall. I take as many of the lower leaves as I want, whenever I want. We have enjoyed our collards a lot in both soups and stir-fries, though I have not tried making kale chips yet. As for their care, I occasionally add some additional egg shells and nitrogen or compost and watch them grow. I'm excited to see them change color this winter - as I have heard they turn a reddish-purple as the days get shorter. 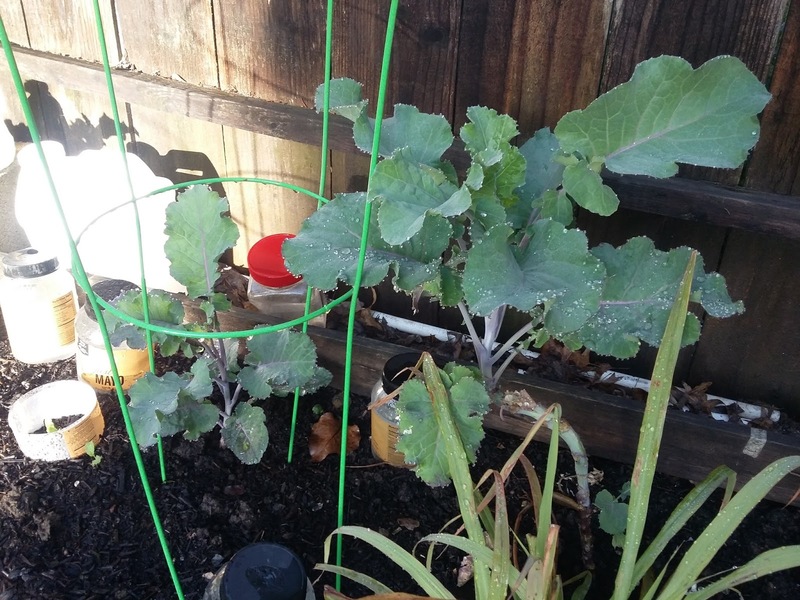 So far, I am an extremely proud owner of some Tree Kale… or Perennial Collards. 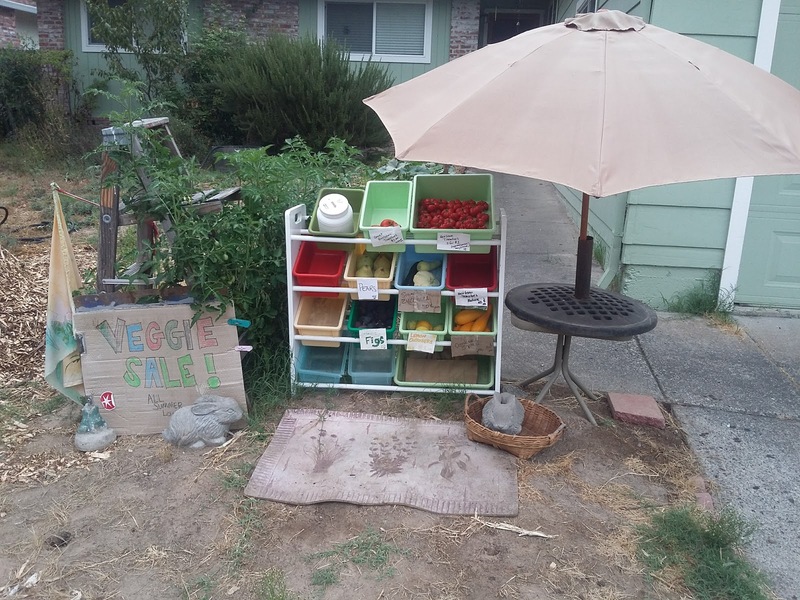 So, I happened to be walking in my parents neighborhood Sebastopol, California and came upon this delightful little vegetable stand. A home-made farm stand in one's neighborhood is probably the next best thing to having veggies grown in your own backyard. 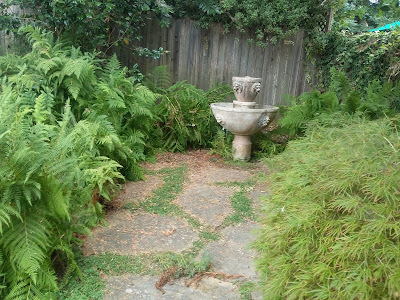 A few months ago I had the opportunity to visit my Dad's house and have a look at the garden that my step-mother had created. 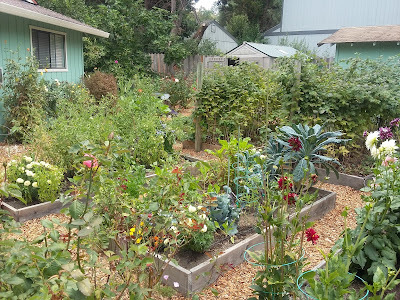 Unlike my garden which is much more functional than aesthetic, the garden here was both functional and beautiful. Like me, you can see what vegetables, fruits and flowers you can identify or you can just appreciate the pictures for what they are. Either way, I hope you enjoy! While I thoroughly enjoy the pursuit of a variety of Carosello cucumbers, I do my best to keep from growing multiple varieties all at once. It is not that I do not appreciate each one, but rather that I appreciate each one so much that I want to keep it true to its type – if a cucumber is supposed to be short or long, round or oval, light or dark, striped, blotched or a uniform color – it should remain predictable. My most recent experience attempting to grow the light Carosello Polisello proved that, if a variety is not carefully maintained, it will result in being completely unpredictable. The initial Carosello Polisello that I was introduced to was a drought-resistant, crispy medium-sized light cucumber with dark spotching. 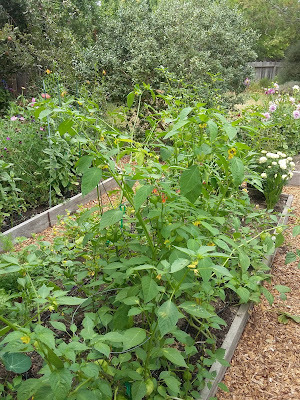 The last time I grew this variety in 2012, I selected out all the light fruit with dark splotching, regardless of size. Because I then selected the dark Polisello with such good results - with over 75% success, I thought that this next trial would go well. Third try - did much better than the first two because of the heat. Though there were quite a variety of cucumbers in the initial grow-out in 2012, I had culled in the process of selection, and I considered the initial planting only as a mix-up of seeds. Nope. It turns out that, if bees are involved, that even with selection it can be difficult to isolate specific morph of a polymorphic vegetable. The plants continue to grow. From my experience, the Carosello Polisello has a number of color, length and taste genes that interlap. The first year I grew them, there was no bitterness to the fruit. In fact, most cucumber-melons are, as a rule, bitter-free. This season a portion of the fruit were bitter, regardless of color. (This was incredibly disheartening because it makes the process of ideal morph selection even longer by adding another factor). The expectation of a harvest is wonderful. Plants reaching for the sky. 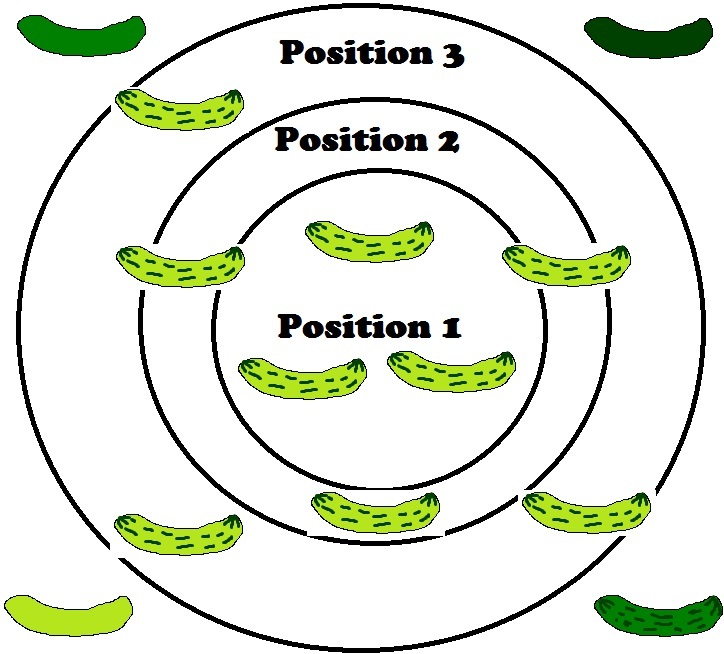 The problem of dealing with bees in a monoecious plant - where both female and male structures are grown in different places on the same plant - is that bees may take pollen from a nearby male part of Cucumber B and pollinate the female flower of Plant A. 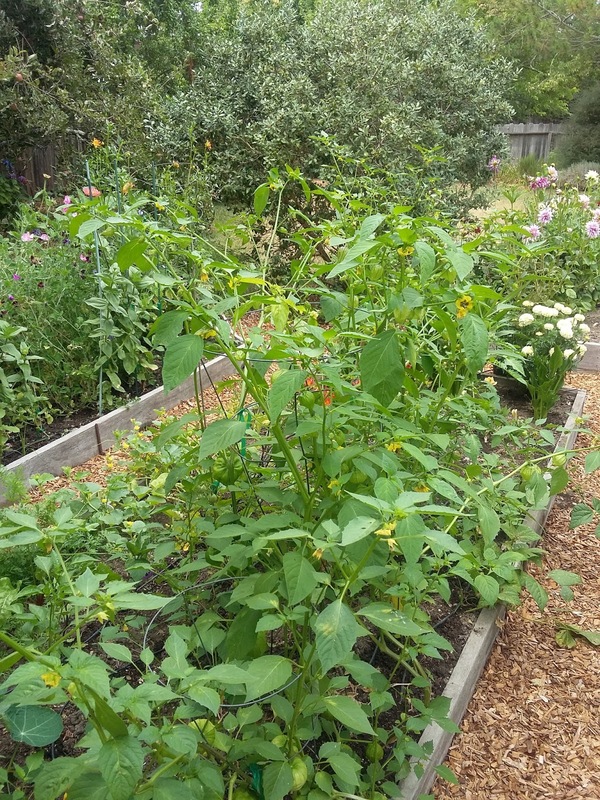 Because the gardener cannot remove all the unwanted cucumber types in a selection until the fruit begins to form, it is difficult to cull a plant from the population based on fruit color or pattern until its flowers have spread their genetic material to all the other plants in the garden. This means that, even if you are selecting for a specific trait from an F1 (first generation hybrid where up to 50% of the population exhibit a specific trait) to get to an F2 (second generation hybrid, where ideally 75% of the population exhibits a specific trait) you are having to fight the bees, who are making your plants a homogeneous genetic mess. A closeup of the skin when the fruit gets larger. Some of the Carosello were dark, some were light, some were medium dark, some were medium dark with darker splotching while others were light with dark splotching (the target morph in my 2017 grow-out). The amazing thing is that, given time, each of these factors can be isolated and remedied if the gardener has both the ability to isolate the fruit and the time to select for the most desirable traits. A look at the top of this one. Despite the odds presented to me by all the busy bees, I did find one way to help increase the chances of success with my random assortment of cucumber varieties. A cluster of three plants with light fruit and dark splotches presented the possibility that, if I labeled the middle fruit from the peripheral fruit, I could get closer to the 75% desirable morph than the 50% desirable morph. My Target approach to selecting for light cucumbers with dark splotching. Like a target, the closer I get to the center, the more likely it will be that the next generation of seed will produce light cucumbers with dark splotches. 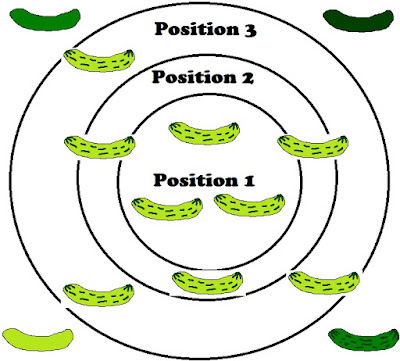 Out of 9 cucumbers out of three plants, three were in the center (desired position 1), three were around them (desired position 2) and three were on the outer edges of the group of plants (desired position 3). I kept all my position 1 and 2 seed and tossed all the position 3 seed. I figure that I can work off of the position 1 seed and use the position 2 seed as backup. These numbers tell me how close I am getting to my ideal. The inner lines and dark splotches are beginning to show. Carosello Polisello - not as much splotching as I would like. Definitely very light in color! Another picture a day or two later. Later in the day, under different lighting. Another C. Polisello picture for effect. C. Polisello, looking a little shady. We’ll see how this technique pans out for the future, but as for the near term I will probably be focusing on a few varieties that are a little more consistent. In the meantime, enjoy my little Youtube clip about the Polymorphic Carosello Polisello.